You could make the argument that a woman’s worth is measured by her face – perhaps literally. A recent survey reports that women in the United States spend $300,000 over the course of our lifetimes, just on products that go on our faces. There is some regional variation: on the East Coast, women have more expensive faces, wearing an average of $11 worth of beauty products each day. In the Far West, in areas like Montana, the average cost drops to around $5 a day. 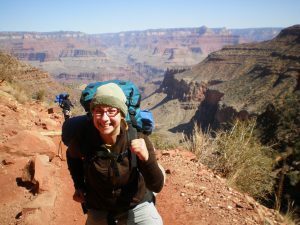 Barefaced hiking out of the Grand Canyon in 2009. By the time I walk on the door on a workday morning, I’ve applied no less than thirteen products. The idea, I suppose, is to look like me, only better. The tally doesn’t count shampoo, facial cleanser, body wash, and shaving cream in the shower. You could say that it is my choice to do this. No one is forcing me. And yet. I did the math. If I spend 15 minutes on an average workday styling my hair and putting on makeup, for 250 workdays per year (roughly) = 62 ½ hours go into looking better. That’s over 1 ½ workweeks. And this calculation is only scratching the surface; it doesn’t count time at the gym, time getting haircuts, the occasional manicure or pedicure. All of this is time I’m not researching or reading or building new professional skills. All of it is time I’m not writing. 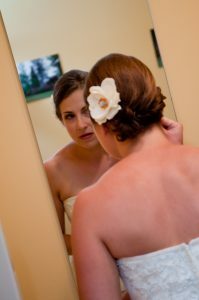 Applying makeup before my wedding in July 2012. So comes the double burden for women in the professional space – and arguably, anywhere that women work in Western culture. We must not only be competent, but also attractive – or at least take steps to enhance our attractiveness. There are real financial costs if we don’t. According to a landmark study by Cornell University, attractiveness, and specifically weight, have measurable impact on promotions and wages. So we are in a bind, spending our time putting this stuff on and then spending our hard-earned wages on buying more of it. I don’t know if Jane Austen reached for the rouge pot before setting off for a local dance, or if Charlotte Bronte plucked her eyebrows before her meetings with her London publisher. And while I’m bold enough to spend most Saturdays bare-faced, I’m not ready to brave a client meeting in such a state. Yet I can’t help but wonder what would happen if I did. Do it? (The barefaced meeting.) And tell us about it in the next blog? I’m genuinely curious. Yes! I don’t think we can ever have gender equality when we have makeup, long hair, and high heels. I guess that’s my stiletto rule. Nice to meet you today!